In the ongoing effort to curb overdose deaths from opioids like heroin, police across Alaska are getting trained to use a new tool. Naloxone — a medication that rapidly reverses the effects of an opioid overdose — has long been used by emergency medics, but now it’s being deployed to police departments and non-profits at the front line of the state’s opioid crisis. Even with millions of new federal dollars being spent, the demand in outpacing the supply. 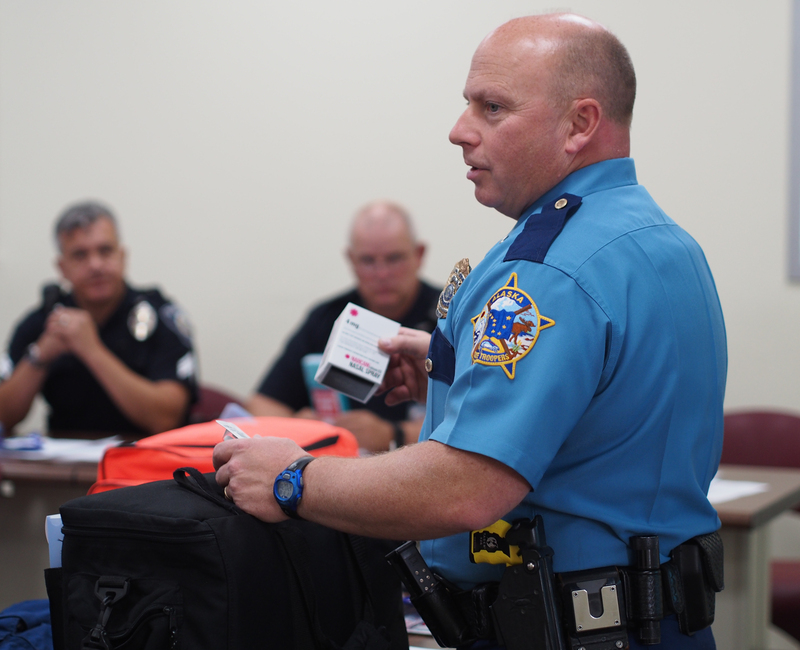 A roomful of police listened as Lieutenant Steve Adams showed them how to use Narcan, a brand of nalaxone that comes in a small bottle you could fit inside a purse or jacket pocket. Adams showed how to properly use the nasal spray if someone’s overdosing. Adams works on drug enforcement with the State Troopers, but his audience today is from a patchwork of agencies. The training is part of a push to get more doses of naloxone to people who are often the first ones to find somebody overdosing. “As law-enforcement we’ll find somebody passed out, or we’ll get a call that somebody’s passed out in a public restroom in a stall or passed out in a vehicle in a parking garage,” Adams said. Naloxone blocks opioid receptors in the brain, and almost immediately counteracts an overdose — although it may take several doses. There are almost no negative side-effects, even if its given to someone by accident who isn’t on opioids. The medication has been around since the 60s, and widely used by medical professionals. But now public health and addiction recovery advocates want to make it as common as defibrillators or epipens: a simple medical intervention the public can use. And Adams said state troopers are in a perfect position to help give the mandatory 15-minute training to dispense Narcan in communities across Alaska. “Our goal is to provide it to every Alaska State Trooper, and to provide it to every other agency — federal, state, and local — who would like to have it,” Adams said. One of those agencies is the police and fire department at the Ted Stevens International Airport. Sergeant Daniel Juarez said at least once a month officers will find someone who has overdosed on a nearby roadway or in a terminal bathroom before a flight. “Well, a lot of times we’re going to be there usually before paramedics, and the sooner we can administer possibly a life-saving treatment we’d like to do that,” Juarez said. The governor’s disaster declaration on the opioid crisis, along with a lesislative bill last year have increased access to the medication. Non-profits like MyHouse in Wasilla distribute Narcan kits. The Alaska AIDS Assistance Association, which runs the state’s largest needle exchange, has given out 300 to 400 of the kits, and routinely requests more. Even nurses and security guards from the Anchorage School District were recently trained. Narcan isn’t cheap. Over the counter at a pharmacy it costs about $150 for a two-dose pack. But the state buys that same amount $75 with federal money from the Department of Health and Human Services through a $4.2 million five-year grant. The kits are given to individuals for free. Andy Jones helps administer the state grant. He said they originally aimed to distribute five thousand Narcan kits this year. “Since February 15th we have distributed 6300 kits, and the pace continues to get faster and faster because more and more overdose response programs in communities are coming online,” Jones said. Gathering the data is difficult. Jones said so far they’ve counted at least 39 saves. But those figures depend on medics, police, or volunteers submitting a form that says they used Narcan. Jones admits there are likely many administering the medication and not generating a record. In 2016, an estimated 88 Alaskans died from opioid overdoses. In Anchorage, the paramedics with the Anchorage Fire Department remain one of the main bulwarks against overdoses. According to figures from AFD, since the start of the year they’ve used naloxone an average of 35 times a month — more than once a day although those numbers are skewed slightly by a surge in overdoses in May that are believed to have been caused by heroin laced with the powerful synthetic opioid fentynol. But they can’t access the federal grant, and are using their budgets to pay for the increasingly used medication. AFD Assistant Chief Scheunemann said last year the department spent just over $14,000 on naloxone. This year, they’d almost hit that amount by the end of the summer.